A few months ago I attended a conference for aging baby-boomers called “Recalculate.” I had a chance to reconnect with some good friends from my YFC and Forest Home days, Bob and Carol Kraning, their son Kent and his wife Robin. The Kranings (both the elder and younger Kranings) were the featured conference speakers and they did a marvelous job sharing their personal stories in a very transparent and helpful way. They spoke about unexpected and often unwanted transitions in life and were able to address this topic with the authority of their own experience. At one of the sessions, Kent taught a lesson from 1 Samuel 23:1-14, a story about David and a town in Judah called Keilah. Quite honestly, I had no recollection of a town called Keilah. Somehow this town didn’t make much of an impression on me in my reading of the Old Testament. But Kent’s teaching about Keilah helped me make a decision I was mulling over at the time–whether or not to resign from the staff at College Avenue Baptist Church. To summarize the 1 Samuel passage, it’s a story about David during the time he was being hunted down by King Saul. David and his army of 600 men are on the run. 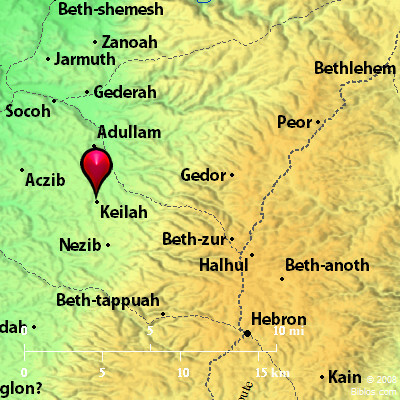 But while he is fleeing Saul’s armies, he hears that the town of Keilah is being attacked by Philistines. David asks God, “Should I try to save Keilah or stay on the run?” God answers, “Go save Keilah. I’ll help you defeat the Philistines.” So David does what God tells him to do and wins an impressive victory over the Philistines. But the story doesn’t end there. David stays in Keilah, no doubt enjoying the spoils of victory. Saul hears about all this—that David is hiding out in Keilah, and so he begins planning a massive attack on the town in order to catch David. David prays again and this time God tells him that he is in danger. It’s time to hightail it out of Keilah. David does, Saul calls off his attack, the town is saved once more and David avoids getting killed by Saul. I immediately thought of College Avenue Baptist Church. I know God called me there for a reason (if not for a season). I didn’t slay any Philistines, but I know I did what God called me there to do. But for some time now, I have heard God calling me to move on. So after much prayer and discussion with my wife, I resigned my position as Pastor to Generations effective January 1, 2015. I’m not moving on in the sense of leaving the church. Marci and I have invested five years of our lives in the people who make up our CABC family and we really don’t want to walk away from the relationships that we have made there. Unlike David, no one is trying to kill us, at least no one that we know of. I am a free agent once more and will now serve God in other ways. No, I am not retiring (I will write more about this later). I want to spend more time with the Lord. I want to spend more time with my wife. I want to spend more time with my grandkids. I want to do more writing, speaking, banjo playing. I want to surrender completely to my God and allow him to use me any way he can. I am very excited about what God has for us next. Where is your Keilah, past or present? This entry was posted in College Avenue Baptist Church, Ministry, Personal, Theology and tagged College Avenue Baptist Church, Keilah, Kraning, Pastor to Generations, Recalculate, the church. Bookmark the permalink.